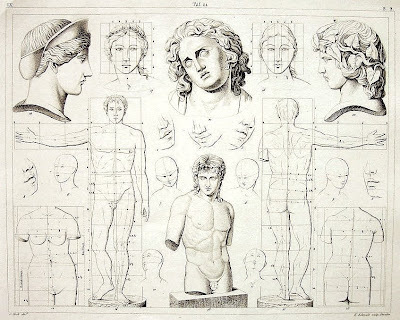 Two steel engravings show examples of how to draw human proportions. 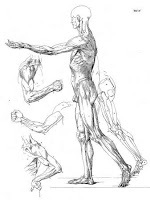 They give examples of human anatomy, muscles and proportions for the artist. The engravings are by an unknown artist, published by Johann Georg Heck who was active in the mid nineteenth century. He published an influential volume on art history, anthropology and natural history. Here is a link to a Google Books result for Iconographic Encyclopaedia of Science, Literature, and Art By Johann Georg Heck. Here is a link to the out of print edition at Amazon.com: Iconographic encyclopedia of the arts and sciences . Here is a link to a reprint by the Scholarly Publishing Office, University of Michigan Library: Iconographic encyclopaedia of science, literature & art. Systematically arranged by J.G. Heck. Tr. from the German with additions, ed. by Spencer F. Baird... . And the book on the web: Iconographic encyclopaedia of science, literature & art. Here is a link to a new version: Iconographic encyclopaedia of science, literature, and art. And here is an Amazon.com link to another book with illustrations: Encyclopedia of Source Illustrations: A Portable Picture Library of 5000 Steel Engravings (2 Volumes) . 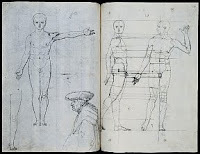 Another source for proportions of the human body as used in art is Analytic Diagrams of Proportion and the Human Body: From L'idea della architettura universale can be seen at The Metropolitan Museum site. Dicussion on the Golden Section in Architectural Theory by Marcus Frings. Other copies are available at AbeBooks.com. Enter the search term "Iconographic encyclopaedia of science, literature, and art ," or "Johann Georg Heck, or "Encyclopedia of Source Illustrations." The Art Student's Guide to the Bones and Muscles of the Human Body and Lessons on Foreshortening is available as a download from Figure-Drawings.com, and as a printed book from Amazon.com . 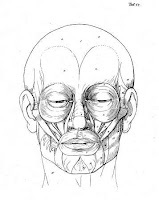 Johann Gottfried Schadow , muscles of the face, muscles of the human body side view, human skeleton. 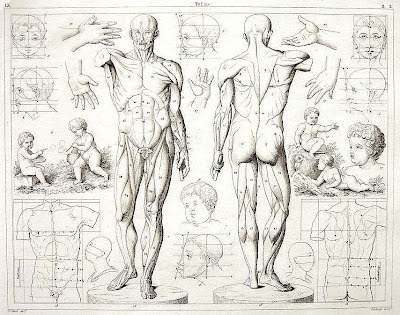 The Art Student's Guide to the Bones and Muscles of the Human Body: and Lessons on Foreshortening . I have a post about this book here. 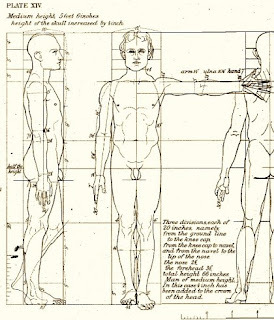 Here is an interesting page showing how to render human proportions. 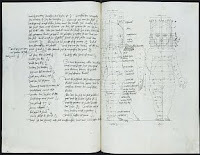 It shows the body in different views: Body Pattern, from Goregoregore.com. 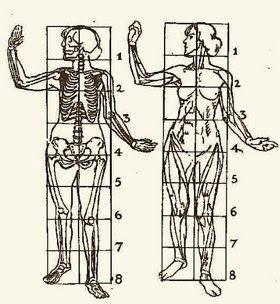 Another post on human body proportions: The Proportions of the Members in a Human Body. 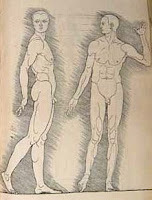 Another post showing a Japanese drawing of human proportions: Kuwagata Keisai (Kitao Masayoshi) - Human Proportions, Actions and Sketches. 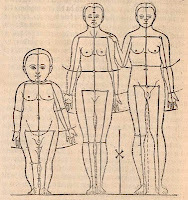 And one about the work of Claude Perrault: Les proportions du corps humain, measurées sur les plus belles figures de l'antiquité. 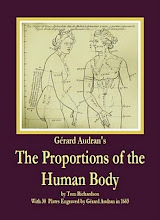 A post about my book: The Sculptor and Art Student's Guide to the Proportions of the Human Form. 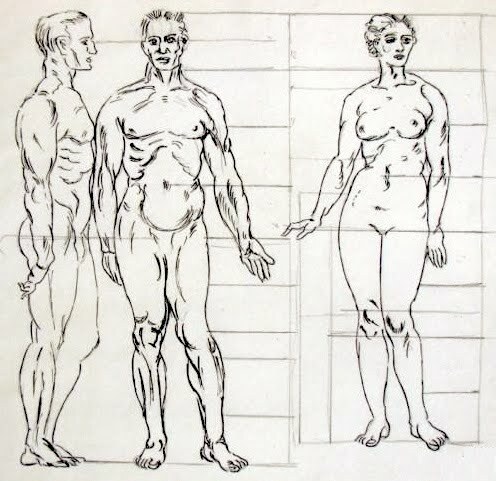 A post about a Dutch book on human proportions and drawing the human figure Female Proportions, male Proportions - Natuurlyk en schilderkonstig ontwerp der menschkunde. 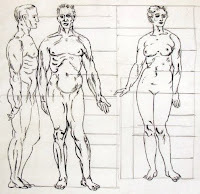 Two of the images from the book, The Sculptor and Art Student's Guide to the Proportions of the Human Form. 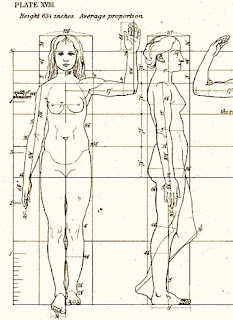 The Art Student's Guide to the Proportions of the Human Form at Amazon.com. The Art Models books are a modern update of the engraved patterns of human body proportions and anatomy. With a series of photographs of the figure in the same pose but photographed from different angles, they provide the artist with the nexty best thing to having a live model to sketch from. 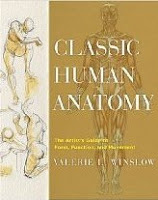 Another book that might be of interest is Anatomy for Art Students, Painters and Sculptors, it is available both as an ebook at Figure-Drawings.com and as a printed book at Lulu.com. I have a post about it here. Link to the Museo Thyssen-Bornemisza page on Durer. Link to the Wikipedia page on the Vitruvian Man. 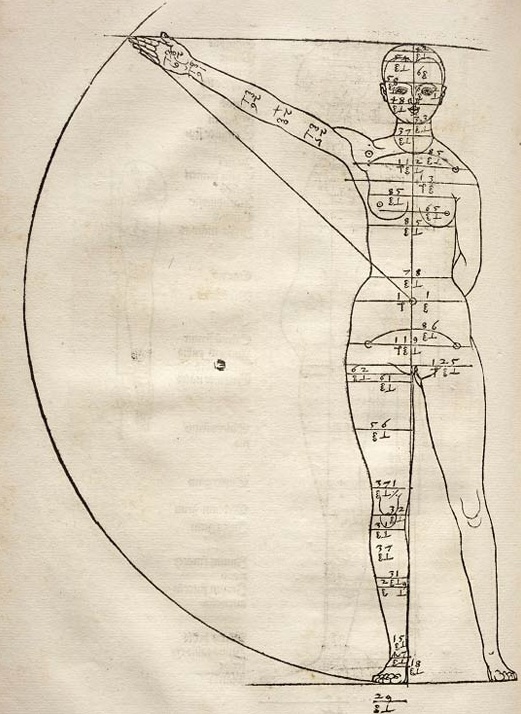 Link to the National Library of Scotland Page about the Vier Bücher von menschlicher Proportion. Three studies on the proportions of male figures and profile of an elderly man with a hat. Text and two sketches on the proportions of an infant. The Saxon State Library - Dresden State and University Library (SLUB) was established on 22nd January, 1996. It has emerged from the former Saxon State Library (established in 1556) and the former University Library of Dresden Technical University (established in 1828), and ranks among the largest scientific libraries in Germany, with a stock of 8.6 million units. 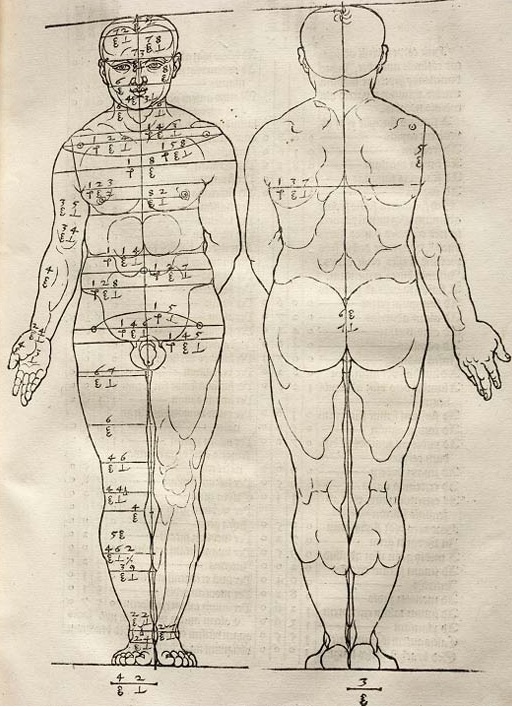 Images from De Symmetria Partium in Rectis Formis Humanorum Corporum by Albrecht Durer. This exceptional volume of De Symmetria and Underweysung der Messung bears the arms of the Holy Roman Emperor Rudolf II, a passionate collector of the work of Albrecht Dürer (1471–1528). Bound together in exquisite Bohemian vellum, forming a sammelband, these two works create an illustrated manual for still-life and portrait artists. 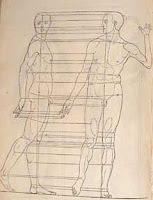 De Symmetria is the first two books of the Latin edition of his elaborate study of human anatomy and proportion. Underweysung is the result of Dürer’s lifelong study of geometry, mathematics, and the methods of art. Both books demonstrate Dürer’s technical and artistic brilliance. This Octavo Edition shows these extraordinary works in remarkable detail and includes bibliographical data and English translations of Dürer’s texts. Commentary by David Price. 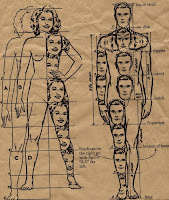 the Real, the Ideal, and the Quantification of the Body"
Another chart of proportions, the human body divided into 7 1/2 heads for the female, and 8 heads for the male, and a link to an art project based on the chart. Martha Miller's Blog. From a 1930's newspaper illustration. Heinrich Lautensack wrote a treatise on perpective, Des Circkels und Richtscheyts, auch der Perspectiva und Proportion der Menscher, which owed much to Durer. The entire book can be viewed online at Digitale Bibliothek - Munchen. 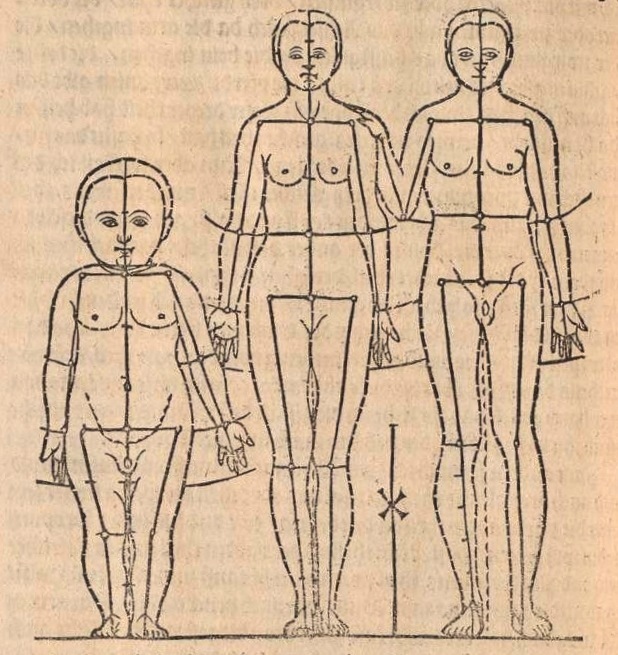 Here is an image showing the realative proportions of man, woman and child. Dover edition of Dr. Julien Fau's book featuring the black and white plates. 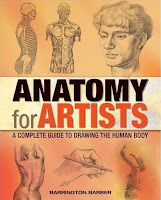 For more complete information about my republished edition featuring the color prints see my post: Anatomy for Art Students Painters and Sculptors. 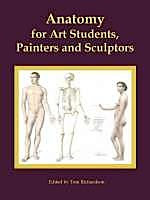 Anatomy for Art Students, Painters and Sculptors a reprint of Dr. Julien Fau's famous work for art students, available both at Amazon.com and as an e-book. 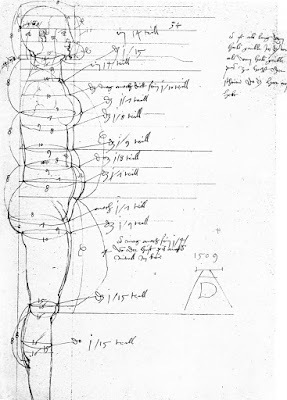 Related: Female anatomy for artists. Amazing blog,i will suscribe to it,congratulations. Thanks for posting all the great images. I have been looking at B&N for these sorts of images to work on figure sculpting and striking out. I will have to page through some of your amazon links. But for now have some material to start with. Nice Blog! Well most of your content and image is original and informative. Here is another site which is also nice in my opinion Famous Artists?? Incredible useful for professional drawing simply one of the best post I've ever seen, thank you. 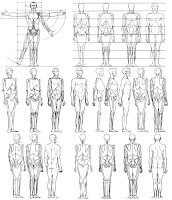 Here are really something have which helpful to know something about how to draw human anatomy..Thanks for sharing this blog to us. This blog is awesome.Helpful to know something.Thanks to the author.